On November 14, 1954, Nehru wrote a note entitled 'Implications of China Visit'; it was an internal note for the Ministry of External Affairs (MEA). During my visit to China, I had a number of talks with the Chinese leaders. I had long talks with Premier Chou En-lai separately. I also had joint talks with Chairman Mao Tse-tung and his principal colleagues, viz., Vice Chairman Chu Teh, Chairman of the Standing Committee of the Peoples' Congress, Liu Shaochi, Premier Chou En-lai, Vice Chairman of the Standing Committee, Sung Ching-ling (Madame Sun Yat-sen), Vice Premier Chen Yen and the Chinese Ambassador in India. On our side in these joint talks, we had our Secretary General, N.R. Pillai, and our Ambassador in Peking, N. Raghavan. We both had interpreters with us. …I referred to Chinese maps which still showed portions of Burma and even of India as if they were within Chinese territory. So far as India was concerned, I added, we were not much concerned about this matter because our boundaries were quite clear and were not a matter for argument. But many people took advantage of these old maps and argued that China had an aggressive intent, or else why continue to use these maps. In Burma also this caused apprehension. Premier Chou [Zhou Enlai] replied that these maps were old ones and China had not done any surveying to draw new maps. Their boundaries even with Mongolia and the Soviet Union were still not clearly demarcated and there were discrepancies. I [Nehru] pointed out that this might be so. So far as India was concerned, I repeated, there was no doubt about our boundaries and I was not worried about them. But I wondered how China would feel if a part of Tibet had been shown as part of India in our maps. Last week, this came back to my mind when Beijing published its first official vertical national map incorporating the vast areas of South China Sea. The South China Morning Post (SMCP) commented that the new map gave "equal weight given to both land and sea, in [Beijing's] latest move emphasising its claims of sovereignty over the disputed waters." Earlier maps showed the islands in the South China Sea on a smaller scale, in a separate box-out in a bottom corner of the map. For a few days, most commentators concentrated on the South China Sea due to the prominence given to the South China Sea on the new map, but on Saturday, the Indian MEA finally reacted. Why? Because they discovered that the new Chinese map shows Arunachal Pradesh as part of China. The Indian press commented: "The MEA dismissed the new map issued by Chinese authorities this week by saying cartographic depiction did not change the reality that Arunachal was part of India." The MEA spokesman said: "The fact that Arunachal Pradesh in integral and inalienable part of India has been conveyed to Chinese authority at several occasions including at the very highest level." What is most shocking is the fact that the spokesperson forgot to mention the Central Sector (Uttarakhand and Himachal) were large chunks of Indian territory (such as Barahoti and Nilang) appear on the Chinese map and not a word for the Aksai Chin and areas around the Panggong tso in Ladakh too. The MEA has nothing to say about these vast areas of the Indian territory? 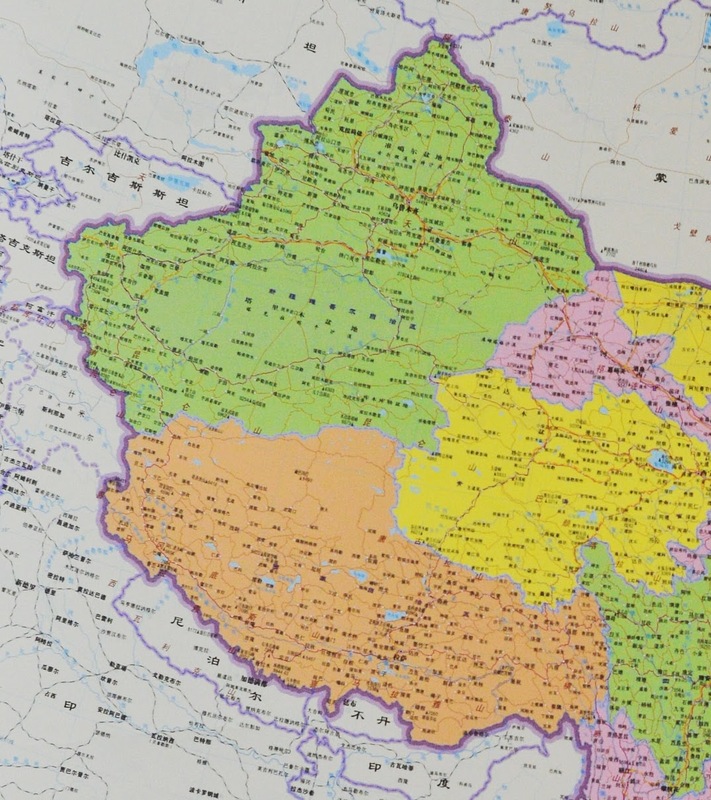 Let us not forget that China’s Survey and Mapping Administration has approved the map published by Hunan Map Press, which in its announcement said the map was of 'great significance in safeguarding the nation’s water sovereignty and territorial integrity'. 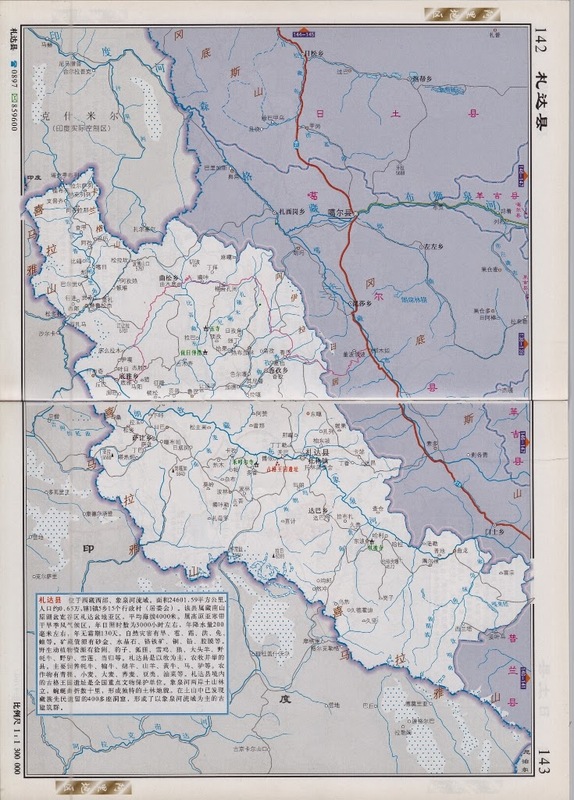 Here is a Chinese map of Ngari region (Central Sector). Why is Delhi so quiet? We will probably be told "Don't worry, China and India are friends". Like in 1954? Sixty 60 years ago too, Beijing had 'no problem' with India. China's problem was with American Imperialism, so it liked to say. While President Xi Jinping vowed that no violations of territorial integrity will be tolerated, he added that no nation (read the US) should be allowed to monopolise global affairs. Xi was speaking on the occasion of the 'celebrations' of the infamous Panchsheel. Xi however made it clear: "Sovereignty is the reliable safeguard and fundamental element of national interest. Sovereignty and territorial integrity should not be infringed upon. This is the hard principle that should not be cast aside at any time". And then, he started indirectly bashing the United States: "All nations should be given equal footing in the global security framework, and share equal rights." Su Hao, a professor with China Foreign Affairs University told SCMP: "The message is that China is not the source of the problem, and it is some external force violating principles of international relations and making chaos in the region." 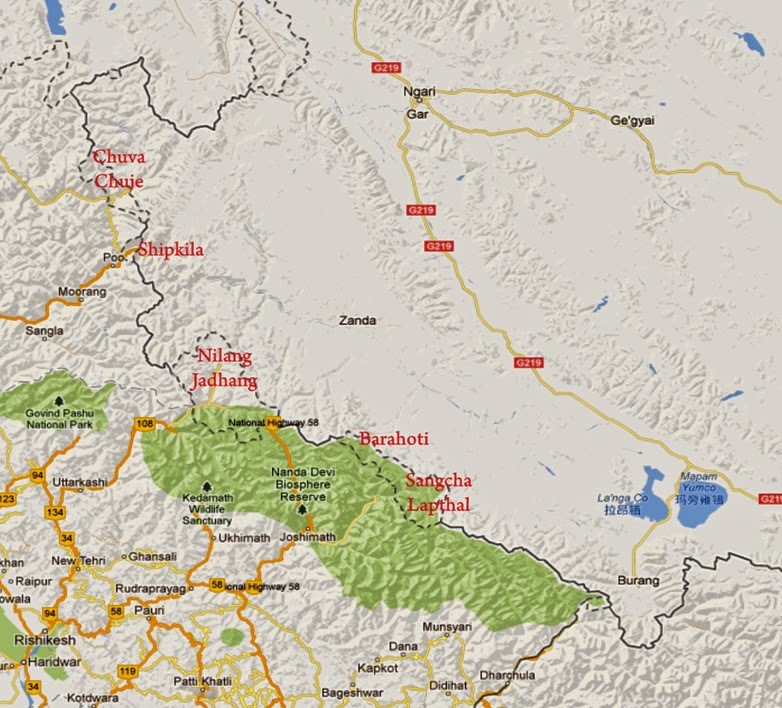 One more 'detail', but which is vital for India, on the new Chinese map, the size of the Chumbi Valley located between Sikkim and Bhutan, seems really bloated to me. Does China plans to grab more territory from Bhutan? My article China lacks human infrastructure, is weakest state in the world appears in NitiCentral. Tsering Woeser, a Tibetan blogger living in Beijing, says on her blog that she knew a Chinese traveller who had been told by a travel agency that Tibetans were no longer able to obtain permission to travel in border areas of Tibet such as Purang. China often says one thing and does another. In Athens, the visiting Chinese Premier Li Keqiang declared that China is committed to settling maritime disputes through dialogue and negotiation on the basis of respecting historical facts and international law. Of course, ‘historical facts’ for Beijing mean its own interpretation of history; ditto for international law. Li also spoke about Beijing’s views on a ‘sea of peace’ with other countries. After China installed an oil rig in the South China Sea in what Vietnam considers its territorial waters in May, Chinese State Councilor Yang Jiechi met with the Vietnamese Deputy Prime Minister and Foreign Minister Pham Binh Minh in Hanoi on June 18, 2014. Though China and Vietnam pledged ‘to rein in maritime tensions’, little has changed after the high level discussions, on the contrary another Chinese oil rig is being set up. Beijing wants to make clear that China is the most powerful State around and it can send diktats according to its interpretation of ‘history’ to every ‘smaller’ nation, whether it is Japan, Vietnam, the Philippines or India. It is called the Law of the Bully; and often, it works. When Li was in London last week, he told David Cameron that if London wanted to do business with China, it should keep quiet on Tibet and human rights issues; the British Prime Minister obeyed. But is The Bully truly that powerful? There is no doubt that an aging Europe often has to listen to orders from a still economically strong Middle Kingdom, which however suffers from acute problems — it has miserably failed to pacify its own ‘masses’. In 1950, Mao sent its First and Second Field Armies to ‘liberate’ Tibet. Nehru’s India acquiesced, Tibet needed to be liberated (though Nehru had doubts, he asked in the Lok Sabha, ‘liberated from what?’). More than 60 years later, whether it is in Xinjiang or Tibet, the masses are revolting against the ‘liberators’. While President Xi Jinping speaks to the ‘masses’ about his Chinese Dream, anyone questioning his dream is immediately imprisoned, often without trial. Boosting employment and income levels. Encouraging urbanisation and interregional migration aimed at expanding the contact and cooperation between different ethnic groups. Strengthening Party organs at the grassroots level in order to eliminate the ‘three evil forces’ — splittism, extremism and terrorism. Bilingual instruction to make all minority youth conversant in the national language and culture. This type of policy has not worked in the past and will not work in the future, for the simple reason that the Party says something and does something else, like for foreign affairs issues. Just for Xinjiang, authorities last week claimed that they had broken up 32 terrorist groups and arrested more than 380 suspects. In the first month of a ‘security campaign’ … and 13 had been executed. The outspoken Uygur economist and respected university professor, Ilham Tohti, has been detained since January. He would have been charged with spreading separatist ideas, i.e. promoting the Uyghur language. Is that a crime? When one closely looks at the situation in China, one realises that the leadership lives in fear. Take Tibet again. 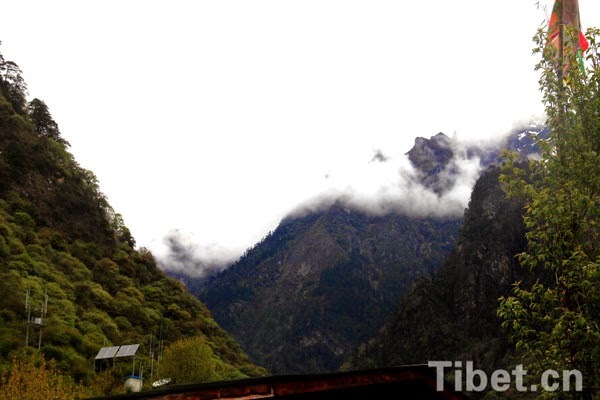 A few days ago, it was reported that Deng Xiaogang, Deputy Party Secretary of the Tibetan Autonomous Region (TAR) has been in Purang County, located near Mount Kailash at the tri-junction of India-Tibet-Nepal. He was said to be inspecting security issues faced by the border guards on India’s border. Is China trembling just because the Dalai Lama is going to give the Kalachakra initiation to tens of thousands of devotees in Leh? Is it the sign of a great power? It is rather surprising, considering the promotion (not to say propaganda), made by Beijing a few months ago about the Mount Kailash. What has happened between the Tibetan New Year in February and today? Just the Kalachakra? The arrival of the Modi government in Delhi? The powerful Deng Xiaogang has been roaming around the Ngari (Western Tibet) region for the last few weeks. Why? On June 20, an article in The Tibet Daily asserted: “The TAR Deputy Chairman, Deng Xiaogang inspected the border county of Rutok in Ngari Prefecture and conveyed to the rank and file of the border policemen, the Party’s cordial greetings”. Rudok is a border town close to Ladakh. Does China fear some Indian infiltrations or local Tibetans taking refuge in India? Why should such a senior officer spend weeks on the border? China is probably nervous about possible infiltrations of Uyghur militants through the Aksai Chin road which enters Tibet via Rutok. The point is that while China has built a tremendous infrastructure — roads, telecommunications, airports, etc, in border areas in Tibet — the ‘human infrastructure’, so important in case of conflict, is entirely lacking. This is the condition 60 years after the ‘liberation’. In this field, China is one of the weakest States of the world. A good chess player takes the initiative? 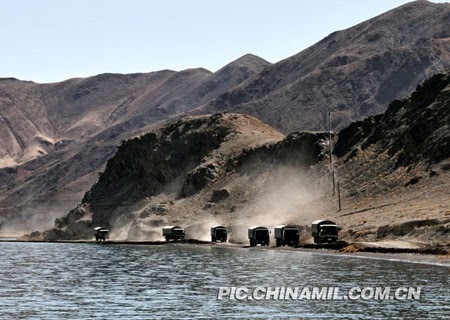 Is this lake-intrusion related to the visit of Deng Xiaogang to Ngari and General Wang Jianping’s (see yesterday’s posting) to Lhasa? 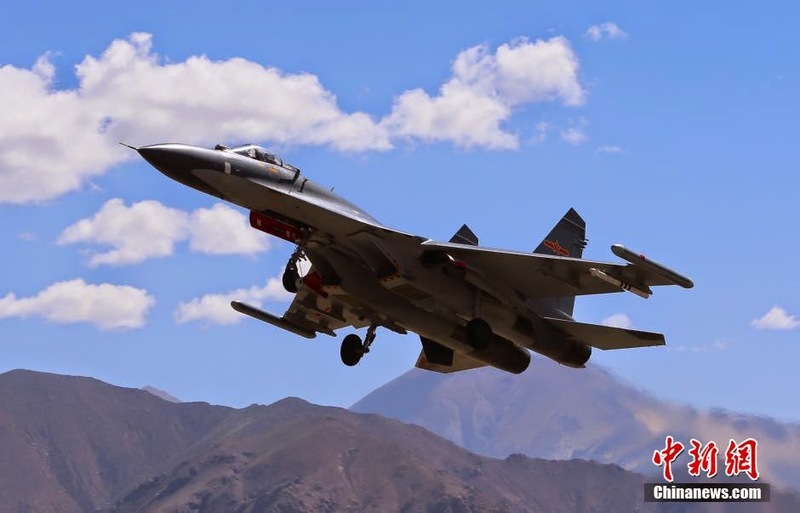 Deng, the Tibetan Autonomous Region's security tsar has been touring border areas of Western Tibet for days and weeks accompanied by Maj. Gen. Gao Wanhai, the Commander of the Public Security Bureau at the Border Defence General Headquarters. On June 24, when the intrusion occurred, Deng was in Ali, the capital of Gar Country of Ngari Prefecture. A few days earlier, he was in Rutok, in the vicinity of the Lake. 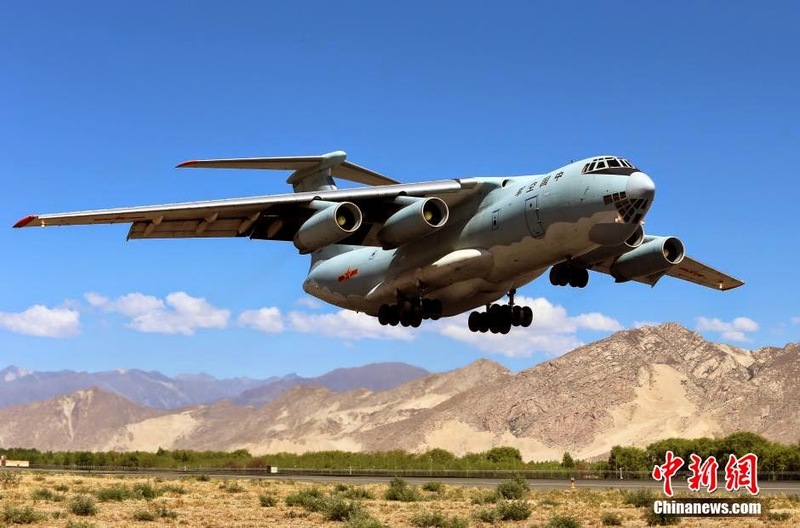 According to South Block sources, on June 24, the Chinese People’s Liberation Army (PLA) boats came 5.5 kilometres into the Indian territorial waters on the Pangong Lake (tso). Some parts of the lake are under Chinese control in the Tibetan Autonomous Region (TAR), while others are under Ladakh (J&K State). 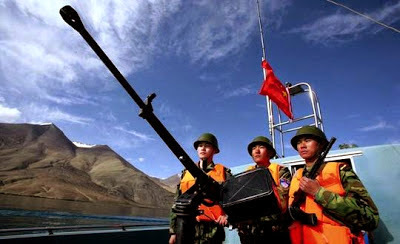 The incursion lasted over two hours, involving four high-speed Chinese interceptor boats that were pushed back by Indian troops, wit their US-built interceptor vessels. 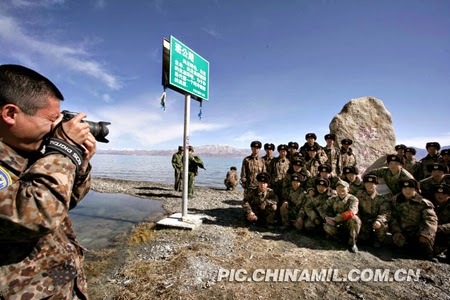 The Hindustan Times says that the picturesque lake, 134 km long and at a height of 4,350 metres above sea level, has seen 12 face-offs between Indian and Chinese troops this year alone: “In 2013, there were no less than 18 face-offs between Indian and Chinese troops in Panggong Tso due to serious difference in perception on the LAC and also due to massive Chinese infrastructure build-up close to the line,” a government official told the Indian newspaper. Moreover, let us not forget that General Wang Jianping, the Commander of the People’s Armed Police (PAPF) visited Lhasa on June 26. 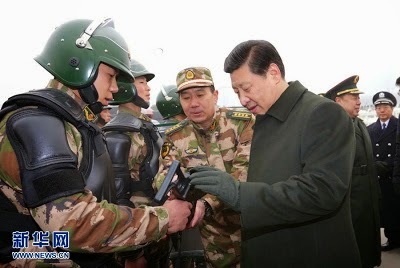 He inspected the TAR’s People’s Armed Police training base, a Traffic police detachment, Tibet’s Forest Armed Police Corps, the 117 Police Division, a detachment of Ngari Police. According to The Tibet Daily, he wanted to get a detailed understanding of the situation. For the purpose, he called on officers and men of the People’s Armed Police. 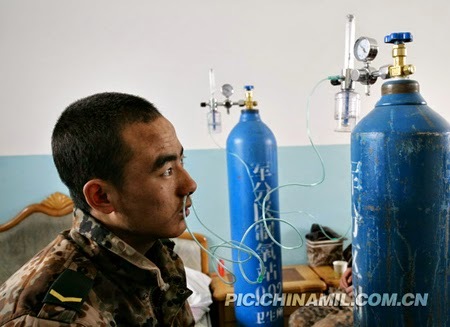 The Chinese newspapers reported that Wang Jianping acknowledged the success achieved by the Armed Police's Tibet Corps and the Armed Police Forces in every work and asked all the armed police officers and men to understand the serious and complicated situation that they are facing at present. He told them to strengthen the police force for war preparation and continue the good job of building up (the police forces). He asked the Force to ensure the completion of every task, giving first priority to the tasks that need to be dealt with urgently, providing a strong support for Tibet’s continuous stability, long term stability and comprehensive stability. ‘Stability’ has been the motto of each and every leader coming to Tibet in the recent months. Walking to the Potala Palace Square’s Police Station, Wang Jianping said that the police should understand in detail the work [in Tibet]; for example, the duty of the Police Station, the range of service, the promotion the urban grid management. The Police has to strongly protect the stability of vast areas, protect people of every ethnic minority, as well as Chinese tourists and visitors from abroad. Wang spoke of the important measures taken by the Tibet Communist Party’s Standing Committee and the TAR government’s to implement the Central Government’s policies for governing Tibet. Behind this Communist jargon, published by The Tibet Daily, lies the firm resolve to control Tibet (and particularly the TAR) in an always firmer hand. This is not good omen for Tibet; the Middle Path promoted by the Tibetans in exile seems far, far away. It remains to be seen if the visit of General Wang and Deng Xiaogang’s tour of the border areas in Western Tibet, is linked to the new aggressiveness on the Panggong tso. It is probably the case in view of the high lever delegation accompanying Deng Xiaogang in Ngari. Tibet received the visit of an important guest, General Wang Jianping, the Commander of the People's Armed Police Forces (PAPF). In peacetime, the PAPF's main tasks include performing guard duties, dealing with emergencies, combating terrorism and participating in and supporting national economic development. 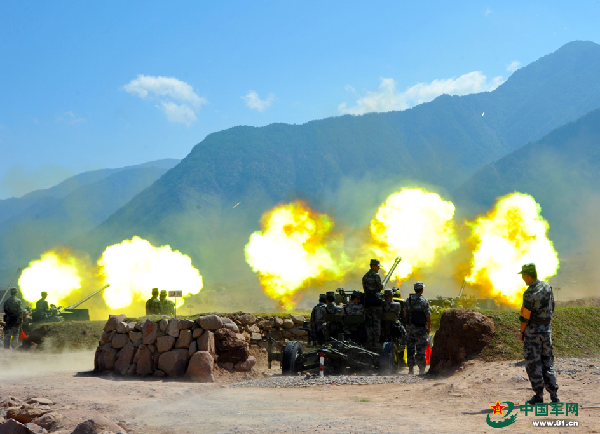 In wartime, it is tasked with assisting the PLA in defensive operations. 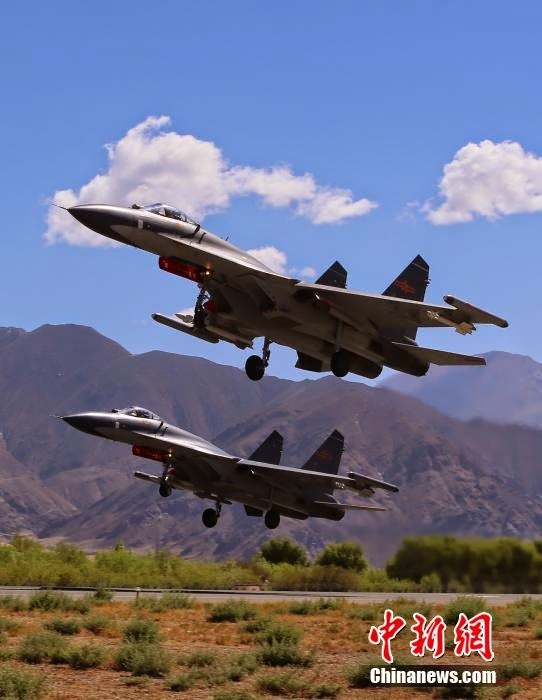 Based on the national information infrastructure, the PAPF has built a three-level comprehensive information network from PAPF general headquarters down to squadrons. It develops task-oriented weaponry and equipment and conducts scenario-based training so as to improve its guard-duty, emergency-response and counter-terrorism capabilities. The PAPF is composed of the internal security force and other specialized forces. The internal security force is composed of contingents at the level of province (autonomous region or municipality directly under the central government) and mobile divisions. Specialized PAPF forces include those guarding gold mines, forests, hydroelectric projects and transportation facilities. 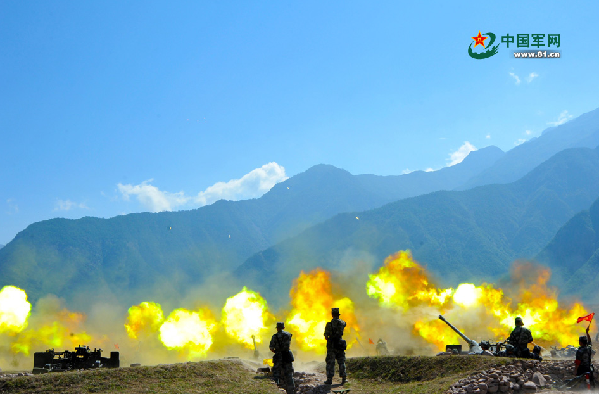 The border public security, firefighting and security guard forces are also components of the PAPF." The PAPF is over-all responsible for the 'security' of the Middle Kingdom, and incidentally for extinguishing Tibetan 'immolators' (fire-fighting). The border guards (in the case of Tibet, the borders with India) are also under the PAPF. And let us not forget that the PAPF's budget is larger than the PLA's. See my earlier posting on this, the Defence White Paper on Tibet. General Wang Jianping is an old Tibet-hand. Han by nationality, he is a native of Hebei province. He was born in 1953, joined the Army in 1969. In 1997, he was promoted to major general and lieutenant general in 2007. He served as PAPF's deputy commander for one year. before becoming Commander of the Chinese People's Armed Police Force in 2009. General Wang was one of Hu’s favorite. He was elevated twice in 2009 — from PAP chief of staff to Vice-Commander, and then Commander. Importantly, he served as Commander of the Tibet Autonomous Region's (TAR) PAPF from 1996 to 2000. He knows Tibet well and particularly the Ngari region. The TAR's entire Standing Committee (minus Deng Xiaogang still roaming in Western Tibet) was in attendance to receive General Wang. But rest assure, Deng was soon back in Lhasa to report to the General about his long 'inspection tour' in the Indian borders of Western Tibet. (see my posting Why is Deng watching the Seaguls). While in Lhasa, General Wang inspected the troops on the square in front of the Potala Palace! The choicest place for a parade, for the Chinese leadership. 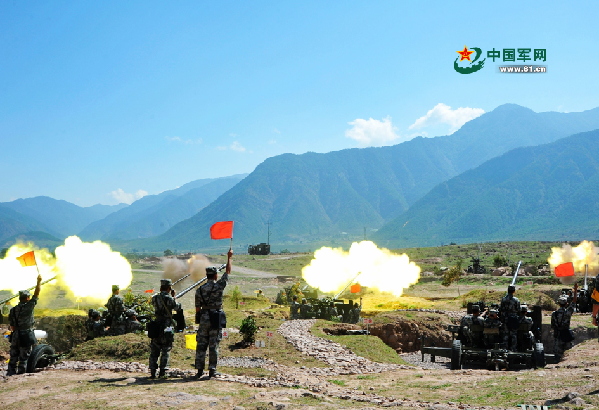 In the meantime, military exercises continue on the Tibetan plateau. 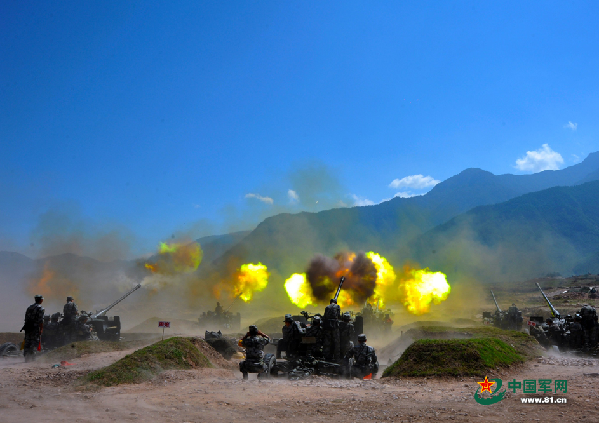 Chinamil.com reported that "an anti-aircraft artillery detachment of an air-defense brigade under the Chengdu Military Area Command (MAC) fired targets in the air on June 19, 2014. The brigade took its troops to an unfamiliar [sic] area to conduct live-ammunition firing training in mid-June, 2014." 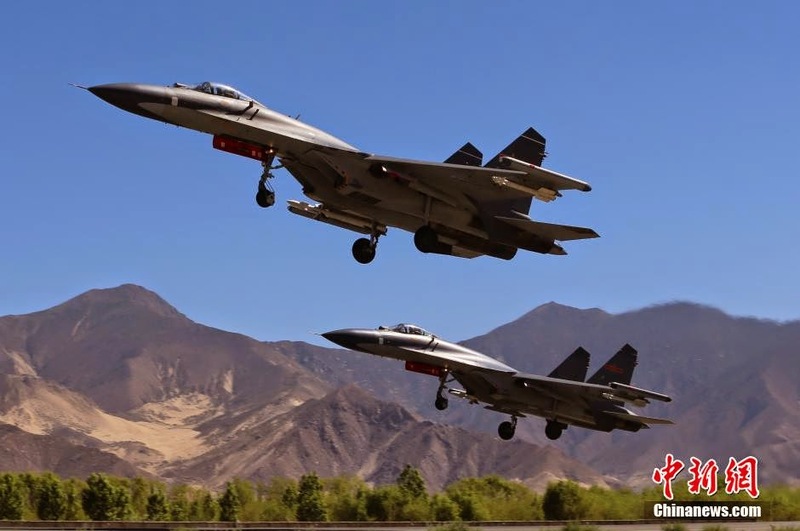 Further, according to The People's Daily: "On June 17, an air force division of Chinese People's Liberation Army (PLA) conducted actual combat exercise at a military airport on the snow-covered plateau to improve combat capability of the troops." What is going on Tibet? This morning, The South China Morning Post annouced: "Two major generals in the PLA with connections to Sichuan province have been detained as part of a corruption investigation, two sources with knowledge of the matter said. The detention of the senior officers is thought to be part of a wider inquiry into alleged graft in the military. Both men were taken into custody last month, the sources said. One of those detained, Ye Wanyong, is retired, having formerly served as a commissar in the Sichuan military region." Maj. Gen. Ye Wanyong spent some 37 years in Tibet before transferring to Sichuan in 2006. He served in Nyingtri, Lokha and Lhasa where he was posted as a Deputy Political Commissar. Are the corruption charges related to the time when Ye was posted in Tibet? 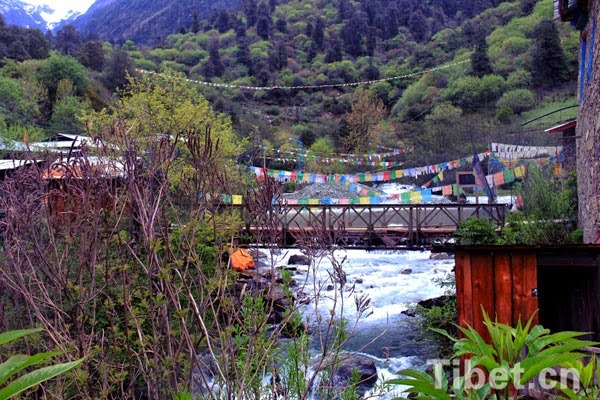 China Tibet Online recently promoted the region of Tsari in Southern Tibet. 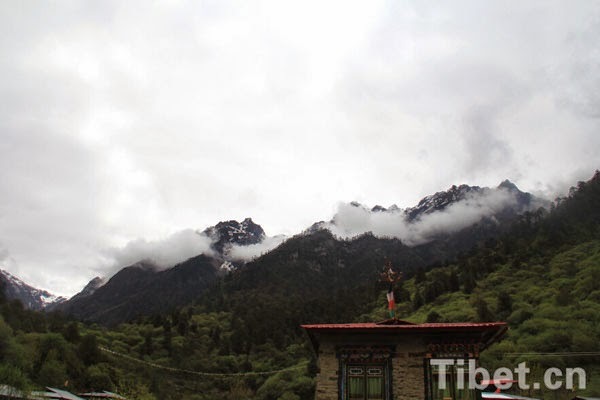 It thus praised the area: "Dzari (Tsari) Township, 2,800 meters above the sea level, is located in Luntse County of Lhoka Prefecture, southwest China’s Tibet Autonomous Region. Dzari means the holy mountain in Tibetan language. 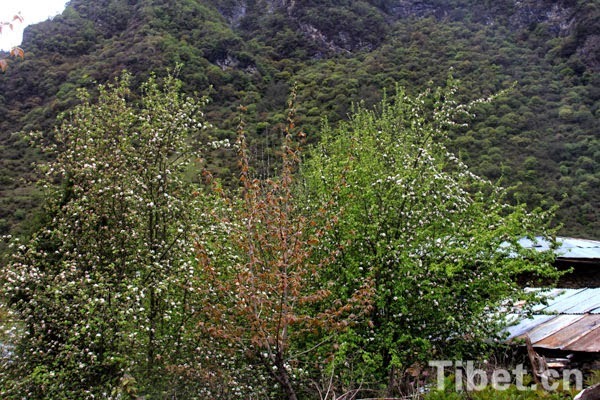 Hailed as the Tibet’s Shambhala, Dzari Township boasts its lush vegetation, moderate weather, still lake, running brook, vast forest, holy mountains as well as a satisfactory variety of herbs." But Tsari has been more than just this. 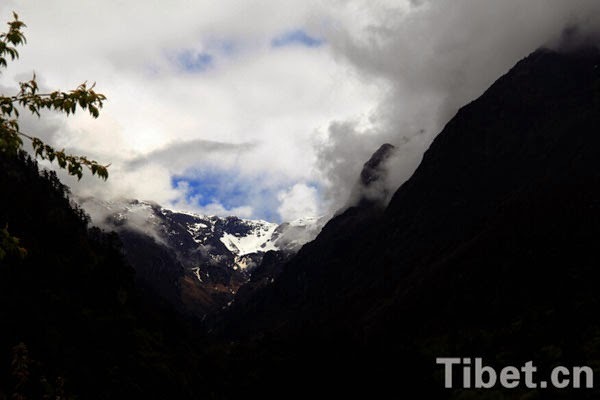 It was once one of the most sacred pilgrimages in Tibet. One of the characteristics of this pilgrimage was that it was running across the Indo-Tibet border (the McMahon Line). Half was in Tibet, half was in NEFA (India). I always thought that it would be a great Confidence Building Measure, if India and China could agree to jointly organize the pilgrimage again one day. But reading the reports of Deng Xiaogang's tour in Western Tibet, it is clear that China is too nervous to envisage such a bold step today. I post here extracts of my book, 1962: The McMahon Line Saga on the Tsari pilgrimage. 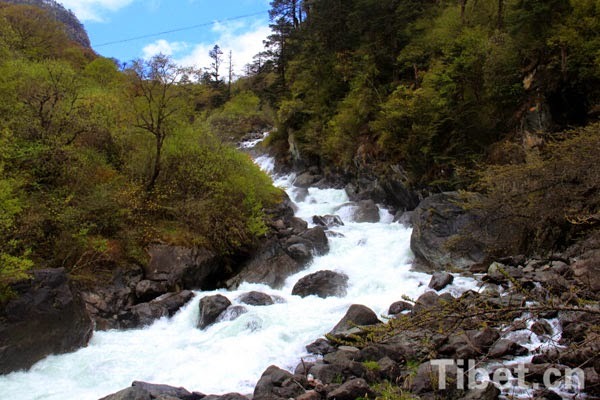 [these] rivers encompassed the southern slopes of the famous Tibetan holy mountain of Dakpa Shelri at Tsari. The large-scale, 12-yearly circumambulation of Tibetan Buddhist pilgrims around the mountain known as the Rongkor Chenmo, had the character of a state ritual for the Ganden Phodrang [Tibetan Government]. Pilgrims in this huge procession crossed the McMahon Line below the frontier village of Migyitün in Tsari district and followed the Tsari Chu southwards. They then turned back up the Subansiri westwards, crossing the McMahon Line once again to reach the first Tibetan frontier settlements in Chame district. In doing so, they traversed non-Tibetan lands during this entire southern leg of the procession. This was the territory of the Mra (Tibetan: Morang Loba) clan, which ran downstream along the Tsari Chu valley and around its junction with the Subansiri at Geling Sinyik, and also of the neighbouring Na (Tibetan: Khalo, Lungtu Lopa) community of Taksing, which extended upstream along the Subansiri heading westwards towards Tibet. Payments in kind were regularly made to both the Mra and Na by the Ganden Phodrang in recognition of the periodic passage of tens of thousands of pilgrims via their territories, and also so that their assistance could be gained in helping the procession proceed smoothly. The Lodzong, a ritualized tribute payment of various Tibetan goods, was made immediately prior to each Rongkor Chenmo. Shares of the Lodzong were given to the Na and Mra, but also to members of other clan-based groups collectively called Tinglo or Tingba by Tibetans. These latter groups lived lower down the Subansiri River and in the upper Kamla River area, and they regularly threatened to disrupt the pilgrimage unless they received a customary amount of Tibetan goods. Our interest in the long pilgrimage, the Rongkor Chenmo, is mainly because its route crosses over to India, south of the McMahon Line. As described by Huber the sacred journey involved crossing south to the McMahon Line towards the junction of the Subansiri-Tsari, and a return back north across the line. Already in the early 20th century , tens of thousands of pilgrims are said to have performed the Rongkor. The junction of the Chayul-Chu with the Subansiri-Tsari is about twenty miles south of the McMahon Line as the crow flies. As far as I could gather from the minor official who called on us, [Chikchar] was a pilgrim economy, being the main centre for the circuit of the holy mountain. The great pilgrimage took place every twelve years, in the Monkey Year. 100,000 pilgrims usually made the pilgrimage, many of them coming from Pome. The Pobas [Tibetans] sent a hundred soldiers; fifty were sent from Trasum in Kongbo and thirty from the frontier village of Tron on the Chayul river. These were to protect the pilgrims from attack by the Lopa tribe of Daflas, through whose territory the pilgrims had to travel when making the Great Pilgrimage. The pilgrims went down the Tsari river, past Migyitün which apparently was recognised as the frontier of Tibet-to where the Tsari river joined the combined waters of the Char, Nye and Chayul. This was five or six days' journey. Then they turned up the combined rivers, towards Sanga Choling, which they reached about a fortnight later. Some pilgrims went very much slower, the minor official said; and I inferred there was merit in delay. The slower, the better. I asked how the pilgrims managed on the route, especially when they were going through Lopa country. Apparently all along the route were places called Tsukangs where one man lived and supplied the pilgrims with fuel and hot water, but not with food. Food the pilgrims had to carry with them, but at Migyitün and elsewhere people came to sell food to the pilgrims at extortionate prices. 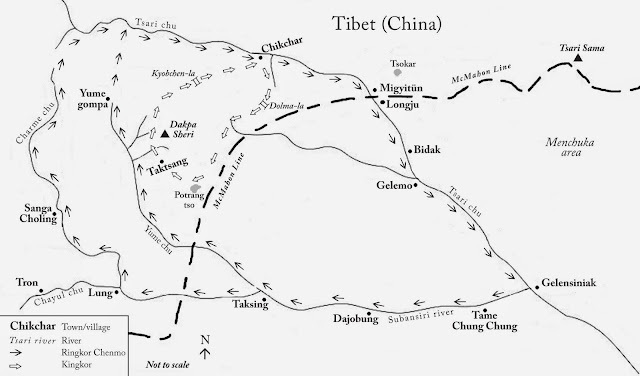 The Lopas were not allowed to travel up the Tsari valley beyond the frontier village of Migyitün because the Tibetans feared they would damage their shrines. They were induced to give the pilgrims unmolested passage through their own country by the Tibetan government lavishing on them presents of woolen cloth, tsampa and swords. Capt Bailey then describes the other pilgrimage, the Kingkor. There was also a Small Pilgrimage which was performed annually between the 19th day of the third month and the 15th of the eighth. After that date it was closed, because it was a sin in making the pilgrimage to take any life and the path was infested with small maggots about as long as a short match, which lay so thick upon the ground that it was impossible to step between them. …as the route crossed the Drolma [Dolma] pass, which was taboo for women. Some of them however would go as far as the pass and then return, acquiring thereby what little merit the taboo allowed them. On the 15th of the eighth month all women were sent away from Chikchar and went to live at Yarap, though I could not discover for what reason. We visited the temples. The largest was Pagmo Lhakang, down in the valley. It had a golden roof, and the principal image, that of Dorje Pagmo , was studded with precious stones. A golden butter lamp was set before it. On the hillside was a monastery with twelve monks who wore their hair long and matted behind. Here the central image was that of the Tashi Lama; and in another temple the central image was one of Drukpa Rimpoche, the incarnation of Sangling. I asked where the Tsari river flowed after it joined the combined waters of the Char, Nye and Chayul. The official said that it did not flow into Pemako, but turned south to India; which fitted in with our hypothesis that it formed part of the headwaters of the Subansiri. They had heard from the Lopas of some military expedition, which they assumed had been Chinese, since the Lopas described the sepoys working the bolts of their rifles in the same way as the Chinese. The Chinese presence in the early 1910’s sounded the alarm in Delhi and London. Something had to be done to stop the possibility of a Chinese advance in the region. 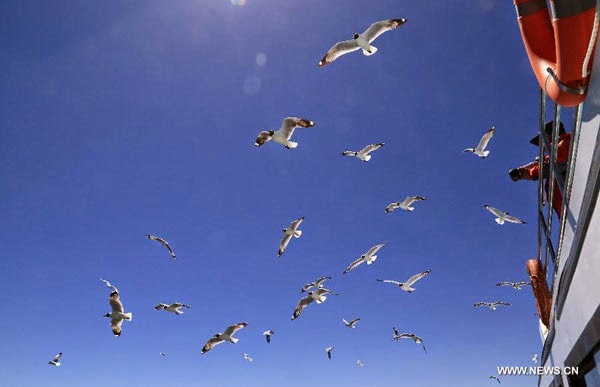 Why is Deng watching the Seagulls? 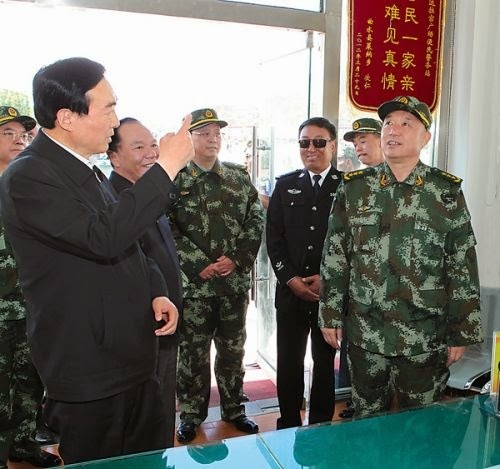 A few days ago, International Campaign for Tibet, reported that last month, Deng Xiaogang, Deputy Party Secretary of the TAR visited Purang County in Ngari Prefecture to inspect the border security and the People’s Liberation Army bases. Purang is located near Mt. Kailash and not far from Dram, the border town with Nepal. The ICT deducted: "Deng’s visit was likely to be intended to send a signal of vigilance by the Party authorities in the buildup to the Kalachakra in Ladakh. Deng, who is also secretary of the Party Committee on Politics and Law in the TAR, was cited by the state media as saying that border security checkpoints are key to maintaining social stability in the Tibet Autonomous Region." ICT further added: "Woeser, a noted Tibetan writer who lives in Beijing, cited a Chinese traveller who had been told by a travel agency that Tibetans were no longer able to obtain permission to travel in border areas of Tibet such as Purang where Mount Kailash is located." It is rather surprising, considering the promotion (not to say propaganda) made by Beijing a few months ago about the Mt. Kailash. The China Daily wrote: "The year 2014 marks the beginning of the Year of the Horse in China and the 'Year of the Wooden Horse' in the lunar calendar of Tibetan people. The Year of the Horse is also the 'recurrent birth year' of Gang [Kang] Rinpoche (or Mount Kailash), a holy mountain in west Tibet. Since circling Gang Rinpoche in the Year of the Horse is a scared tradition among Tibetan Buddhists, this year has seen an endless stream of people flocking to the region to perform pilgrimage,"
The Chinese newspaper added: "The Tibetan people's freedom of worship has been respected and protected in the Tibet autonomous region and other areas inhabited by Tibetan people since the region's peaceful liberation, especially since the adoption of reform and opening-up. ...Monks and nuns from different Buddhist sects now enjoy a full freedom to preach and conduct religious activities. Believers are also free to visit monasteries and holy mountains to worship and perform religious rituals. They can circle the holy mountains, recite Buddhist scripture and spread Buddhist teachings, and take part in all kinds of religious activities." Remember Wu Yingjie, another Deputy Party Secretary of the TAR who camped for weeks in Nagchu last year. This exercise was part of the 'massline' campaign initiated by Xi Jinping, the Party's General Secretary. Is Deng going to replay the Wu episode? On June 20, an article in The Tibet Daily mentions: "Deng Xiaogang comforts the rank and file of the police in border County". It reports that "the Deputy Chairman of the Tibetan Autonomous Region, the Party Secretary of the Politics and Law Committee, Deng Xiaogang inspected [Rutok], the border county in Ngari [Prefecture] and conveyed to the rank and file of the border policemen, [the Party’s] cordial greetings. The article explains that troops stationed on the border, in this county, live at the highest elevation of the country [read China]. Deng Xiaogang traveled to inspect and provide guidance to the [Rudok] county. He cordially shook hands with the soldiers and comforted them. Deng Xiaogang pointed out that since long time, the party and the people have a great trust in those who are stationed at borders, facing cold and lacking of oxygen; facing harsh environmental conditions, while always sticking to their positions, fulfilling conscientiously their duties, carrying forward the sacrifice, without fear of fatigue, fighting tenaciously and continuously to overcome the difficulties and challenges, in order to defend the national sovereignty and the territorial integrity and maintain the stability of the southwest border of the motherland, to maintain harmony, peace, economic development and stability for the region, promote national unity, border stability while improving people's livelihood, promoting religious harmony. Further, Deng Xiaogang stressed that: "Tibet is very special strategic location, is an important barrier for the national security, development and stability in the border areas is an important part of the region's overall situation. In recent years, under the strong leadership of the CPC Central Committee, the regional party committee, the government is firmly asking the people to unite and lead the development of the region, go all out to maintain stability, and improve people's livelihood as much as possible, to build prosperity, harmony, happiness, rule of law, a beautiful new socialist Tibet and work hard." He further hoped that the officers serving on the border keep this strategic and overall perspective in view and fully realize the extreme importance of doing the [Party's] work on the border, increasing the sense of responsibility and sense of mission and urgency, establishing a long-term battle plan, [and that they] are determined for a continuous fighting, conscientiously implement the General Secretary Xi Jinping series of important speech, etc. etc. etc. Apparently Deng Xiaogang was very satisfied: he ordered the policemen [border guards]: "...according to the law to crack down on all criminal activities that endanger national security and social stability, and never let separatism and terrorism and other violent criminals undermine the excellent situation of stability and unity in our region. He was accompanied by a high level delegation. Apart from th Communist usual jargon, the question remains why should a senior, powerful leader like Deng spend weeks in such a remote places. 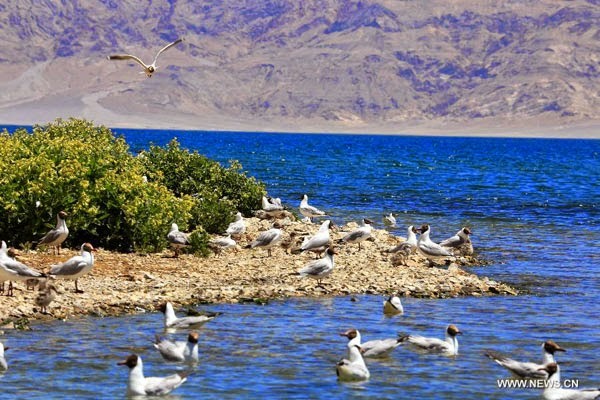 Just to watch the seagulls fly over the Panggong lake or to circumbulate the Kailash? There is another possibility, Deng may be nervous about possible infiltrations of Uyghur militants through the Aksai Chin road which enters Tibet in Rutok. That would be a more serious issue for China! Ethnic Mingling in Xinjiang and Tibet? I have often mentioned on this blog that Beijing's 'ethnic' policies for Tibet and Xinjiang have a lot of similarities. 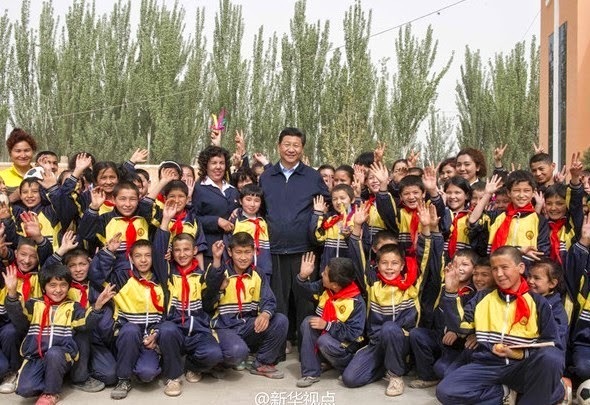 For example, when President Xi speaks of introducing “nets in the sky and traps on the ground" in Xinjiang, the policy was (successful for Beijing) experimented in Tibet earlier. Last year, a delegation from Xinjiang's capital Urumqi visited Lhasa to learn the tricks of 'security' and 'stability'. The delegation was taken around by Tibet's Security Czar, Deng Xiaogang who is also the Party's Deputy Secretary of the Tibet Autonomous Region. Deng is responsible for the 'net in the sky and traps on the ground' in the TAR. This excellent article of the China Brief describes the situation after the second Central Work Forum on Xinjiang quite accurately. What is interesting (and sad), is the introduction of the 'mingling' factor in both the policies of Xinjiang and Tibet. In Tibet, the Party Secretary, Chen Quanguo recently promoted inter-marriage between Tibetans and Hans. It is definitively a new policy, though senior leaders like Gyalo Thondup or the late Panchen Lama opened the way several decades ago. It appears that the same policy of 'mingling' and 'fusing through increased contact, cooperation and intermarriage', will now be encouraged in Xinjiang. What could happen is that the migrant Han workers will take a 'temporary' Uyghur wife, but this will not solve Beijing's problem. This reminded me of Robert Ford, the British radio operator posted in Chamdo in the late 1940s, in his book, Captured in Tibet, he wrote: "I became quite friendly with Horkhang Se [a Tibetan noble], and he even offered to find me a temporary wife. I was not far from getting one under my own steam. Her name was Pema. She was about seventeen, perhaps less. I met her through her stepfather, a junior official named Khona. It all began when I asked Lhalu if some one could monitor the news-broadcasts from Peking in Chinese." Ford eventually did not take a 'temporary' wife, but that is another story. In Xinjiang, as in Tibet, it is doubtful if the new policy of 'mingling' or 'fusing' can work, there are too many decades of suspicion, not to say hatred, between the 'ethnic' populations and the 'occupiers'. I wonder what the Dalai Lama has to say about the 'mingling'. The recently concluded Central Work Forum on Xinjiang (zhongyang Xinjiang gongzuo zuotanhui) marked a subtle yet significant departure in the Chinese Communist Party’s approach to ethnic policy. Economic development remains a top priority; yet the new generation of Party leaders understands that money alone will not mollify ethnic and religious tensions in Tibet and Xinjiang. Instead, Chinese President Xi Jinping is seeking a more comprehensive solution to the problems confronting these long-restive frontier regions. Boosting employment and income levels among Uighurs in Southern Xinjiang through a new round of fiscal transfers and investment. More urbanization and interregional migration aimed at expanding the contact and cooperation between different ethnic groups. Fortifying Party organs and personnel at the grassroots level in order to eliminate the “three evil forces”: splittism, extremism and terrorism) and shore up social stability. Strengthening state education and bilingual instruction so that all minority youth are conversant in the national language and culture. None of these proposals are particularly new. Yet, the Forum frames them around a new strategic intent: the erosion of ethnic differences, the removal of obstacles to the free “mingling” (jiaorong) of Chinese citizens and the forging of a shared national identity. For over a decade now, a group of intellectuals and party officials have called for “adjustments” to current ethnic policies, some even speak of the need for a “second generation of ethnic policies” that would eliminate ethnic-based rights and autonomy (China Brief, July 6, 2012). The Xinjiang Work Forum reveals their burgeoning influence on top Party leaders; yet it remains unclear how far the new Chinese administration is willing or able to pursue this contentions agenda. The Second Xinjiang Work Forum, attended by the entire Politburo and over three hundred top Party officials in Beijing from 28–29 May, came a mere four years after the first gathering in 2010. Unlike the Central Work Forum on Tibet, which has been held five times (each roughly a decade apart) since the 1980s, Xinjiang is a far more recent, and now more pressing, concern for the post-Mao Party-state. Since the 18th Party Congress in November 2012, Xi Jinping has chaired seven Politburo meetings on Xinjiang, while issuing over thirty directives on Xinjiang work (Xinjingbao, May 30; Xinhua, May 3). In April, he personally toured the region. Fellow Politburo Standing Committee member Yu Zhengsheng, who is the Party’s point man on ethnic and religious issues, has made four official visits to Xinjiang, compared to only one to the Tibetan Autonomous Region. Several times over the last couple of months, Xi Jinping has stressed that: “Xinjiang work possesses a position of special strategic significance in the work of the Party and the state” and “the long-term stability of the autonomous region is vital to the whole country's reform, development and stability, as well as to national unity, ethnic harmony and national security” (Xinhua, May 26; Xinhua, May 1). It is easy to see why. China has witnessed an ugly spate of ethnic and religious violence since Xi came to power, leaving well over 200 people dead and hundreds more injured. Most of these incidents pit China’s embattled Uighur Muslim minority against a steadily encroaching Chinese state and its Han majority. Even more worrying for the Party-state is the spread of this violence out of Southern Xinjiang, where eighty percent of China’s 10 million Uighurs live, into the regional capital of Urumqi and inland cities like Changsha, Guangzhou and Beijing. The savage March 1 knife-attack on travelers at the Kunming Railway Station shocked the nation, with several commentators dubbing it China’s 9/11. The official Xinhua News Agency summary of the Work Forum contains many of the usual statements: “The Party's strategy on Xinjiang has been proven correct and must be continued in the long run” (Xinhua, May 30). Yet, beneath the boilerplate, the language and policy direction outlined in the Forum statement marks a significant departure. Since the 18th Party Congress, Party officials have stressed that “new conditions” (xin xingshi) in Xinjiang create “new requirements” (xin yaoqiu). In contrast to previous assurances that trouble in Xinjiang is not linked to ethnic and religious issues, the Forum unambiguously asserts: “Xinjiang’s most sustained problem is the problem of ethnic unity,” and Xi Jinping is quoted as urging “all ethnic groups to show mutual understanding, respect, tolerance and appreciation, and to learn and help each other, so they are tightly bound together like the seeds of a pomegranate." Since coming to power, Xi Jinping has repeatedly stressed the importance of forging a shared national identity. The “China dream,” he contends, is foremost about the great revival of the “Chinese nation” or “Chinese race” (Zhonghua minzu), a term first coined by Liang Qichao in 1902 and employed by Chinese leaders from Chiang Kai-shek and Mao Zedong to Deng Xiaoping and Jiang Zemin in order to stress the conjoined history, fate and consanguinity of the Chinese people. When he visited Inner Mongolia in early 2014 (Xinhua, January 29), Xi spoke about the need to “bind the people of each ethnic group into a single strand of rope.” On several occasions, Xi Jinping and Yu Zhengsheng have stressed the importance of the “four identifications” (sige rentong): identification with the motherland, with the Chinese nation/race, with Chinese culture and with the socialist road with Chinese characteristics. The aphorism was first employed in the early 2000s, but seldom appeared in Hu Jintao’s official speeches. Xi Jinping’s new language bears the distinct influence of Zhu Weiqun, the former Executive Director of the Party’s United Front Works Department (UFWD) who moved across to the Chinese People’s Political Consultative Conference (CPPCC) at the 18th Party Congress, and now works under Yu Zhengsheng as the Director of the CPPCC’s Ethnic and Religious Affairs Committee. In the past, Zhu has echoed Peking University Professor Ma Rong in declaring that ethnic “blending and mingling is not ‘Hanification,’” but rather the natural course of Chinese history (Study Times, February 15, 2012). Despite his less prominent position today, Zhu Weiqun's public and media profile remains high, far greater than his successor at the UFWD Zhang Yijiong. In recent months, for example, he delivered an important speech on urbanization in frontier regions at the CPPCC (Xinhua, March 9), gave a wide-ranging and widely circulated interview with Hong Kong-based Phoenix media (Phoenix, April 2), and led an inspection tour of grassroots religious management in Southern Xinjiang (Xinjiang Daily, May 7). In the Xinjiang Work Forum summary there is repeated talk about the need to remove ethnic barriers and forge collective identity. The statement includes the controversial phrase “strengthen interethnic contact, exchange and mingling” (jiaqiang minzu jiaowang jiaoliu jiaorong), which the influential Qinghua University economist Hu Angang declared a “new policy orientation” when he outlined his contentious proposal for a “second generation of ethnic policies” in late 2011 (Aisixiang, March 31, 2012). In his interview with Phoenix, Zhu Weiqun admits the concept of interethnic “mingling” elicited a strong response following its inclusion in Hu Jintao’s remarks at the Fifth Tibet Work Forum in January 2010. This was due to fears that, in his words, “this would mingle the ethnic minorities out of existence,” and thus the phrase was subsequently left out of the official statement that concluded the First Xinjiang Work Forum. However, Zhu argues: “In adjusting to the general trend of today’s socialist market economy, we must place more emphasis on the common ground and communality of the Zhonghua minzu, minimizing and getting rid of those things that set apart different ethnic groups and ethnic autonomous regions from non ethnic autonomous regions” (Phoenix, April 2). The sort of “melting pot” Zhu and other ethnic policy reforms believe is in keeping with both Chinese tradition and global norms. Yet there remains hefty opposition to these proposals in the Chinese bureaucracy and other parts of society, not to mention concerns about the implications of any radical shift in the status quo. If Xi Jinping sympathizes with these reformers, as his public statements seem to suggest, it is still unclear whether he possesses either the political capital or the desire to pursue this sort of agenda to its full conclusion. This new focus on interethnic fusion will see the Party-state pursue two potentially contradictory courses in Xinjiang over the coming year. First, it seeks to build a more ethnically integrated labor market by allowing minorities like the Uighurs to migrate into both regional cities like Urumqi as well as costal centers like Shanghai and Beijing. Second, it will redouble its hold over Xinjiang through a deeper penetration into the daily lives of Xinjiang residents by the Party and its security apparatuses. By calling for “the establishment of a mutually embedded social structure and social environment,” the Xinjiang Work Forum signaled a new intention to break down barriers to interethnic migration. The Forum’s concluding statement calls for “orderly expanding the number of Xinjiang minorities who receive education, find employment and live in the interior,” and “orderly guiding the masses of each ethnic group in entering cities for employment.” The building of a “silk road economic belt,” which would link Central Asia with China proper via a network of infrastructure and human flows running through Xinjiang, is also mentioned. At present, over 63,000 Xinjiang students (mainly Uighurs from Southern Xinjiang) are studying at inland schools as a part of a dislocated schooling program started in 2000 (Xinjiang Daily, February 20). There have been similar “export labor” schemes that send unemployed Uighur men and women to work in factories along the Chinese coast. Yet, the scope of these programs is small compared to the size of the idle work force in Southern Xinjiang. Going forward, we can expect these programs to be ramped up, as will the number of Uighur migrants in Xinjiang cities. The regional government has ambitious plans to double the number of urbanites in Xinjiang by 2030 from 9 million at present to 20 million (Xinjiang Academy of Social Sciences, June 4, 2012). Han inward migration is not mentioned, but the Forum did call for the expansion of the Bingtuan, the paramilitary Xinjiang Production and Construction Corps, which is nearly ninety percent Han. Increased interethnic mobility necessitates new social management tools. In order to counter any instability, the Forum stressed the need to beef-up early warning and mass prevention controls, with Xi Jinping quoted as calling for “nets in the sky and traps on the ground” aimed at curbing ethnic and religious violence. Since 2009, the official public security budget for Xinjiang has quadrupled and now amounts to nearly $1 billion per year (Ministry of Finance, February). Money is being spent not only on new equipment and personnel but also new methods of social monitoring. Early this year, the regional government announced it would dispatch 200,000 high level Party cadres to live and work in grassroot communities for a year at a time (Xinjiang Daily, February 15). They are tasked with not only assisting and consoling the masses, but also gathering intelligence in order to nip any potential problems in the bud. In urban areas, Xinjiang is following other cities in building a “grid-style” (wangge hua) social management system. The technique divides communities into geometric zones and then assigns personal responsibility for social stability to a team of party members who are equipped (in theory at least) with the latest computer-enhanced technologies for near total surveillance (Yaxin, January 24, 2012). “In order to achieve complete grassroots coverage,” Xinjiang Party boss Zhang Chunxian recently stressed, “[we must] thoroughly enter and garrison [Xinjiang society] in order that no blank spaces are left behind” (Xinjiang Daily, March 5). The Forum’s full set of recommendations has yet to be made public, and any new initiatives will face serious implementation challenges on the ground. In the past, vested interests and poor governance have blocked reform efforts, with, for example, the current hukou (household registration) system hindering large-scale interethnic migration. In addition, there are at least two blind spots in the Party’s optics on Xinjiang, important obscurations that portent more trouble ahead. First, increased interethnic contact will intensify labor competition as Uighur and Han workers more directly contend for limited resources and opportunities in shared urban settings. There is ample social scientific evidence demonstrating how ethnic competition fortifies ethnic boundaries and, under the right circumstances, increases ethnic conflict and violence. The Party, for example, recently announced new hiring quotas mandating that state-owned enterprises in Xinjiang employ seventy percent of their new staff locally, including twenty-five percent from ethnic minorities (South China Morning Post, June 1). Yet, the Party-state’s “two hands,” the invisible hand of the market and the visible hand of state power, often work at cross-purposes (Foreign Affairs, June 3). The size of Xinjiang’s state-owned sector is shrinking, and thus undermines hiring quotas; and the rumored opening of the massive petrochemical sector to private investment will only make matters worse. China’s current political and legal environment lacks the necessary safeguards to ensure that reforms benefit Xinjiang’s ethnic communities equally. Second, Xi’s new approach fails to address the underlying yet chronic racism in Chinese society. Despite lofty statements about a unified, inclusive, and harmonious nation-state, most Uighurs feel unwelcome and unwanted in China. Their language, religion and cultural traditions are alien to mainstream Chinese society, and despite efforts to create multicultural spaces, Party-defined pluralism is colorful yet largely hollow. Uighurs, in the eyes of most Han, are dangerous criminals and thieves to be avoided; the Han, for most Uighurs, are dirty and infidel invaders who cannot be trusted. Faced with these mutual suspicions, neither community is likely to welcome the other to live side-by-side in the same community, let alone “fuse” through increased contact, cooperation and intermarriage. Minister of State for Home Kiren Rijiju speaks of his plans in the second and final part of an exclusive interview to Claude Arpi and Sheela Bhatt. In this final part of his interview, he speaks of the policies of the Modi government for the Himalayan belt and what Modi’s election as the prime minister means. Tsona (TG) Rinpoche recently passed away in very tragic circumstances and his funeral witnessed some law and order problems. Would you like to comment? Do you see nefarious forces behind this tragic incident? It is difficult to pinpoint the reason for the tragic death of T.G. Rinpoche. But it’s a tragedy for all of us. He was young, a highly revered lama and he took this extreme step. I could not really come to terms with what might be the reason for that. It’s not really comprehensible in my mind. It is a great loss, not just for Arunachal, but the entire Himalayan region because he is the president of the Himalayan Buddhist Association and so many organisations. Rinpoche was running so many institutes. He was the most influential Buddhist leader of the country. This is really unfortunate. Do you think the Chinese could use his demise and his reincarnation? Tsona is located in Tibet, isn’t it? Yes, Tsona is around 70 km off Tawang. About the Chinese, I cannot really comment. I hope a controversy like the Karmapa or the Panchen Lama doesn’t happen. 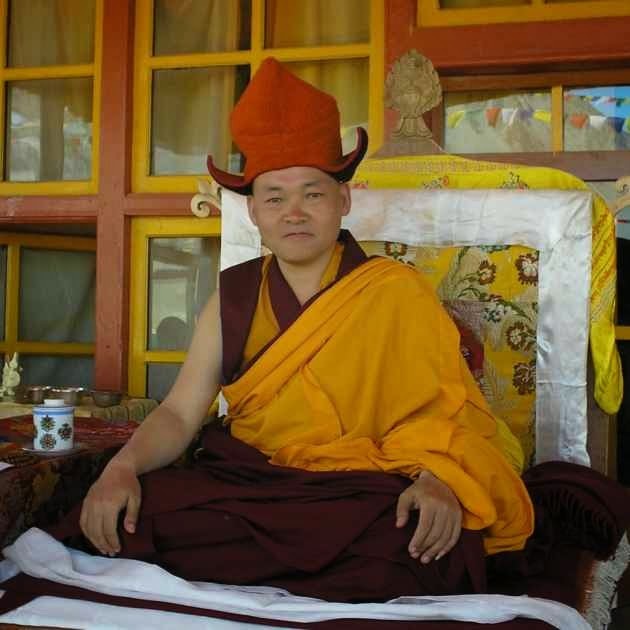 Especially because Rinpoche was from my own region, I hope his reincarnation takes place in Mon Tawang region (Tawang and West Kameng districts) or in any of the Himalayan Buddhist regions within Indian territory. That’s my wish, but these have serious religious connotations. I cannot really apprehend what could have happened. It’s difficult to say. But it was a tragedy, an unbearable loss. In Arunachal, you have people who are either anti-dams or pro-dams. It is an issue that has divided the people in Arunachal and in Uttarakhand. Any comments? In Arunachal, the whole hydro power issue has been mishandled. We need power, but the way the projects were given away raised suspicion in the minds of the people. They have become suspicious because you can award two or three projects but you cannot have the entire basin in one go. It was so haphazardly done that people started objecting. Personally, I’m not in favour of big dams; but I’m in favour of small or medium dams that are environmentally sustainable, can generate revenue for the state and produce power for the country. India is a power deficient country and I hope that we generate a good amount of hydro electricity power from Arunachal, but certainly not by tapping those ultra mega power projects in our state which are not good for the local people, as well as the state. What about the diversion of the Brahmaputra which the Chinese have constantly denied since 2006? Though they are still denying that any such type of project is on the cards, it appears that some engineers in China are still thinking about it. The original plan was to be carried out in the 1950s. 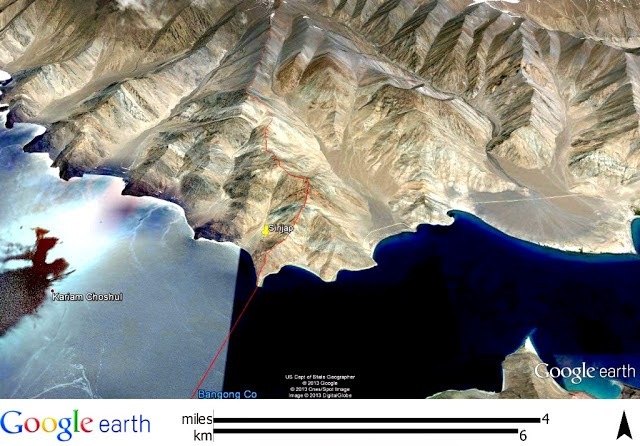 Today, their western route involves the Yarlung Tsangpo (Brahmaputra) river. This is known as the western diversion. Now, whether it is going to materialise or not is still not very clear. It has been reported that their project was going on, however the dams that they are constructing today on the Tsangpo river are only run-of-the river dams. We have to understand this from two points. If they’re going to generate 30,000 megawatts at Metok, then they cannot divert the river. The water has to fall down (to produce electricity); if they divert the river they cannot generate that kind of electricity. This is a technical issue: once the river is diverted from the Great Bend (of the Brahmaputra), to then generate that kind of electricity seems difficult. 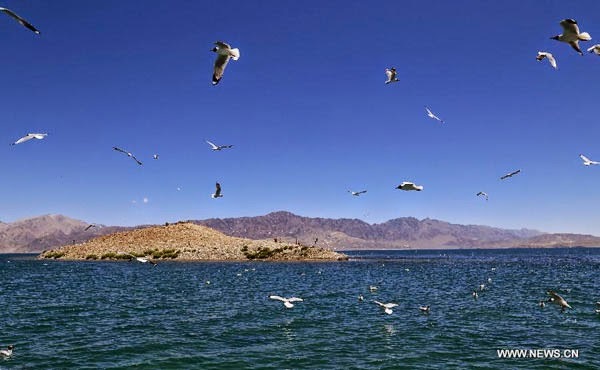 Recently, there was a plan to use the 30,000 megawatts generated in Metok to pump the water up towards Gansu and Qinghai provinces. If that technology exists and if they’re planning to use it, then it is dangerous for us. We hope that the Chinese government will only take such steps after consultation with India. Both countries are planning to move together, to have a better understanding. When both these huge countries have an understanding and a plan to move together, I hope that the Chinese side will not take such extreme steps. Any comment on Chinese Foreign Minister Wang Yi's statement that China was giving stapled visas to people of Arunachal ‘out of goodwill’? That was quite a complicated statement. I could not really understand the intention or the meaning of what the foreign minister said. He wanted to sound positive towards us, but (China’s) action is not exactly that. But I will not be able to comment on what he had intended till our external affairs ministry comes out with a statement. The question of having a ministry for the Himalayas has come up. In the Lok Sabha, your party has 11 out of 13 seats from the region. What are your views on a Himalayan ministry or how it could help tackling environmental and security issues in the region? The entire Himalayan region is not just sacred to us, but it is environmentally very crucial for the subcontinent. Our weather conditions are determined by the lofty Himalayan ranges, 90 percent of the fresh water to India comes from the Himalayan region. If the Himalayan region is protected, then India’s future is bright. But if the Himalayan region is in danger, it will be a disaster for our country. When we talk about having an authority or a ministry for the Himalayan region, it will deal with every aspect of the region. This whole Himalayan region has a unique identity of its own. Never before has the Himalayan region been given the importance that our government has given: by cleaning the Ganga or taking care of the pristine, yet very fragile environmental condition of the whole of Himalayan region. So as an MP from the Himalayan region I’m very hopeful that a road map will be laid out and action will start very soon. 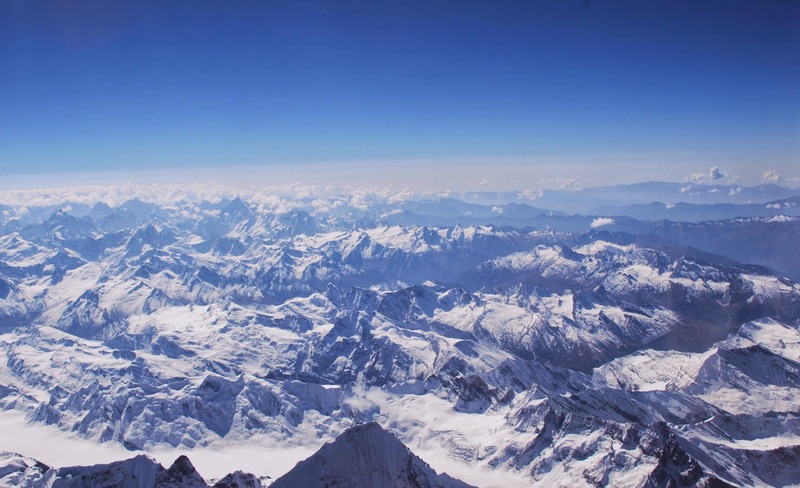 Could you envisage having a group of MPs in the Lok Sabha dealing with the Himalayas? Yes, during the 14th Lok Sabha, I was the convener of the Himalayan parliamentary forum. I have already dealt with this subject long back. Now I’m the minister myself, I will bring some synergy with the members of Parliament for the entire Himalayan belt, Ladakh, Mandi belt in Himachal, Uttarakhand, Sikkim and Arunachal Pradesh. We are definitely going to have a sitting because our problems are similar; if we sit together and come up with a strategy, then it will help the government in formulating policies. The PM said recently that all the ministries should clarify the division of work between the Cabinet minister and the minister of state. During the last 10 years, all the MoS of the United Progressive Alliance government were not given enough work by their ministers. What is your position? I don’t think that we will face this kind of situation. In my case, my senior minister, Rajnath Singh, is party president and I have been his colleague, as one of the office-bearers of the party. We have a long working relationship; now we are both in the home ministry and I’m very comfortable with him. We are working together, for every presentation, with security agencies, for developmental schemes taken up by our ministry. My senior minister has made me very comfortable in the ministry. In fact, I should complement the synergy in the ministry under the leadership of this dynamic leader. When did you meet Narendra Modi for the first time, what was your first impression and how did your relationship grow? When I was general secretary of the Arunachal Pradesh BJP; it was in 1999. Modiji was national general secretary. We had met on many occasions. I remember a north-eastern workers’ training programme, which brought us, north-eastern BJP leaders, to Thane near Mumbai. Modiji came and took a class. It was about the efficiency required for the organisation and how the party leaders should devote their time to expand the party work and its pace. The classes taken by Modiji were very effective and everybody appreciated that he was really hardworking and intelligent. Did the thought that he’ll become the prime minister one day cross your mind? I always thought that Modiji will forever be in the party organisation, but when he was made the chief minister of Gujarat in 2002 I thought that was the best decision the party has ever taken. What makes him different or special? He is also a politician. Every politician has his own trait. Modiji is unique in many senses. His idea about anything is precise and sharp. His working style is focused. Any decision is fast and quick. He is tireless and we get a lot of inspiration looking at him. Even if I’m tired, I look at him. He’s forever fresh. Does he understand the intricacies of the north-east's issues? When he was general secretary, he visited the north-eastern region many times. He understands the north-eastern people. We’re so lucky to have him as our PM and I’m lucky to serve under him. We don’t lobby for ministries in BJP, like people in other parties do. It doesn’t look nice to put yourself forward; it is unbecoming. So we left everything to Modiji. Please tell us your broader view of what has happened in India, on the change that India has witnessed. People were looking for leadership in the country. For a long time it was perceptible to everybody that India lacked a leader. Without strong leadership you cannot get a direction for the country. Direction must be driven by strong leadership. That leadership was provided by Modi. When he came into the scene, people felt he is the man we’re looking for. The Congress lacks leadership. They have a dynastic system where quality doesn’t come into the picture. The vision doesn’t come into the picture; it is the family name that is driving the party. There was a clear cut choice in front of the people, especially the younger generation. We have a fantastic future for the country and a fantastic leader (Modi). How should normal Indians understand the north-east? Because, some attacks and killings in Delhi in recent times are so shocking. First of all, we should not see the problems of north-eastern people as a problem of the north-eastern region. Suppose a person of the north-eastern region is being harassed or discriminated against, it is the problem of the country. India has faced huge problems in the past 200 years under the British rule. It is we, Indians, who complained that we were being racially abused (by the British). If we ourselves are practising the same thing within the country, is it tolerable? No. Secondly, India is multi-racial, multi-ethnic country. If the identity of India is not put into practice, then the idea of India is demolished. Thirdly, the challenge before us is that India is a huge country. I cannot tell a person living in a remote corner of Karnataka to know about Mizoram. How will he know about Mizoram? The only way to let them know is through connectivity, education, publicity. Suppose I’m here as a minister in home ministry, if I’m visible, I’m letting people know who’s the MoS of the home ministry, then people know where Kiren Rijiju comes from; the MoS is from Arunachal Pradesh, that way we come to know each other. Many people have a fear that the Modi government is going to be a closed one and very dictatorial. What are your views? Discipline and closed coordination within a system cannot be termed as dictatorial in any manner. We have come to power with a popular mandate, we are discharging our duty and fulfilling the wishes of the people. We are trying to bring some discipline in our working system, everything is being streamlined; it has to be seen from this perspective. Some people might be saying that Modiji is trying to centralise power, it’s totally wrong. My article Heights hold the key to nation’s sovereignty appeared today in the Edit Page of The Pioneer. A significant article by Mr PD Rai, member of the Lok Sabha from Sikkim, did not create any splash (or even get noticed) by the Indian media. Mr Rai wrote for IANS on ‘A ministry for the Himalayas: Not a day too soon’. 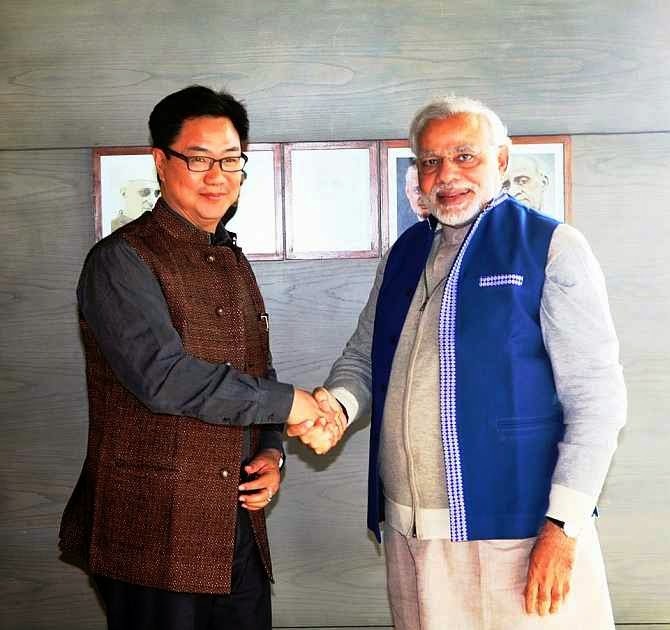 The Sikkim MP noted: “The recent news about the active consideration of Prime Minister Narendra Modi’s Government to start a new ministry to oversee the Himalayas is most welcome. In all these years since independence, ignoring the Himalayas has been wholly unwarranted and shocking. To many of us who have been hammering away at this thought, it is the most welcome of all news emanating from the newly formed Government.” I agree with him. While India has been sleeping, the Chinese were not. Later this year, the train will reach Shigatse (not far from the Chumbi Valley) and China will then continue the line towards Nyingchi Prefecture, north of the Indo-Tibet border. It is not only the train, but a four-way road is also under construction. On June 5, 2014, Xinhua reported: “As a main trunk connecting a dozen of key highways in Tibet, Lhasa-Nyingchi Highway bears great significance in building a flexible traffic network covering China’s border provinces as well as upgrading China’s national defence capacity.” It is interesting that the ‘defence capacity’ is mentioned; Xinhua is usually silent on this subject; it is certainly a warning to the Indian Prime Minister who announced his determination to build roads to the borders. One has to see the recent visit of Prime Minister Modi to Thimphu is this perspective. The new Government sees the Himalayas as one; culturally, environmentally and strategically, the great mountain barrier is one entity. The first step for the new Government is to reinforce India’s defence, while taking along local populations in the mainstream. Union Minister for Environment, Forests and Climate Change Prakash Javadekar already announced that his Ministry was working on a policy for fast-track green clearance for border roads and defence projects up to 100km from the Line of Actual Control. Recently, when Union Minister for Home Affairs Rajnath Singh informed the Indo-Tibetan Border Police that he wanted to visit all border posts to assess the ground situation, (he specifically mentioned the India-China border in Arunachal Pradesh), he was told that a trip to Arunachal would be difficult as many posts are extremely remote; it takes a 10-day walk to reach the LAC. An ITBP officer told The Times of India: “The Home Minister can be flown to Ladakh and Leh but several parts of Arunachal Pradesh would be inaccessible even aerially”, adding that a normal long-range patrol to the border in Arunachal Pradesh takes “as long as 21 days with the perils of negotiating dense jungles and treacherous terrain”. Though Bhutan is today linked by air, many remote areas of the Indo-Tibet borders have not changed much from the day, 56 years ago, when Jawaharlal Nehru visited Bhutan. The then Prime Minister and his entourage had to undertake a long trek via the Chumbi Valley in Tibet. It was the customary and easiest road to reach the Kingdom of the Dragon. At that time India and China were still ‘friendly’. These relations between Tibet and the Himalayan States, which have for centuries been vital to India, deteriorated a few months after Nehru’s visit, with the uprising in Lhasa in March 1959 and the consequent flight of the Dalai Lama to India. Thereafter, the Chinese tightened their grip on the Tibetan plateau; this was a tragedy for India’s defence and the Himalayan economy. By paying his first visit to Bhutan, Mr Modi wanted to show the importance of the Himalayas for his Government. Indeed India’s relations with the mountainous region are a vital one; for centuries, the Himalayas have been the bridge between India and the Tibetan plateau; both shared a common spiritual search. All this changed in October 1950, when the Chinese troops entered Tibet (to liberate it, China still says). Amongst other measures, the Modi Government is thinking to encourage civilian settlements in the border areas. It is a good thing. Whether it is the problems of deforestation, excessive number of hydropower projects, climate change and subsequent melting of glaciers, or careless development, the issues are the same from Ladakh to the Myanmar border. Let us not forget also that the Himalayas have always provided the nation its best soldiers. The Himalayan people are known to be strongly nationalist; this at a time when the local ‘minorities’ on the other side of the Himalayas (particularly the Tibetans and the Uyghurs) are becoming more and more restive, often violently opposing Beijing’s rule. Indeed, the fact that the Himalayans have strong feelings for India, could be a game-changer in case of a conflict. India should not miss the opportunity. The creation of a Ministry for the Himalayas is a great idea. My interview (with Sheela Bhatt) of Kiren Rijiju, Minister of State for Home Affairs. Minister of State for Home Kiren Rijiju speaks of his plans in this first of a two-part exclusive interview to Sheela Bhatt and Claude Arpi. In 2008, Rediff.com spoke to Kiren Rijiju, then a member of the ‘young brigade’ in the 14th Lok Sabha. At 38, he was considered one of the most outspoken parliamentarians of his generation. He is not only young but articulate, educated and a leader with clarity of thoughts as well. Today, Rijiju has assumed new responsibilities. He has been appointed as minister of state in the ministry of home affairs to assist Rajnath Singh. More than ever, Rijiju is the ‘face of the north-east’ in Parliament and Narendra Modi’s Cabinet. Rijiju spoke to Rediff.com’s Sheela Bhatt and Claude Arpi about his new responsibilities, the importance of having someone from the north-east in the home ministry, about the situation on India’s borders, the policies of the Modi government for the Himalayan belt and the meaning of Modi’s election as the new prime minister.